For the first time in three years, The Man and I are on the schedule. He received a promotion at work (yay!!) and so now we’re both working 9 – 5. While this is amazing, I all of the sudden realized that instead of cooking something small and simple for myself, two of us were going to be home for dinner each night. Prior to going to the grocery store on Sunday morning, I made a game plan. I was going to cook. Every. Night. 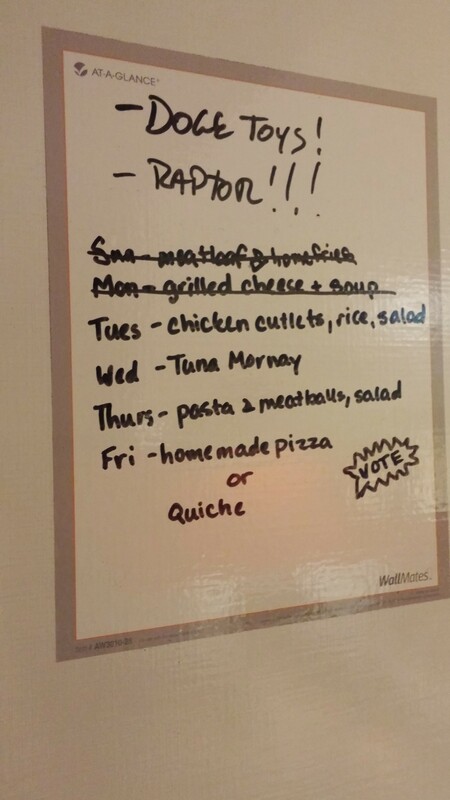 I had placed this cling dry erase board on our kitchen cabinet a long time ago. We use it for notes we need to remember, messages, and sometimes grocery lists. I decided to use it for our menu for the week which has kept me on track. The nice thing about all the meals is that we had most of the ingredients already – just needed some meat – so grocery shopping was easy and pretty cheap. One of my friends thought I was crazy to cook every night, but it has worked out really well. All of the meals take 30 min or less to prep, and with the exception of the meatloaf only about 20 – 30 minutes to cook. 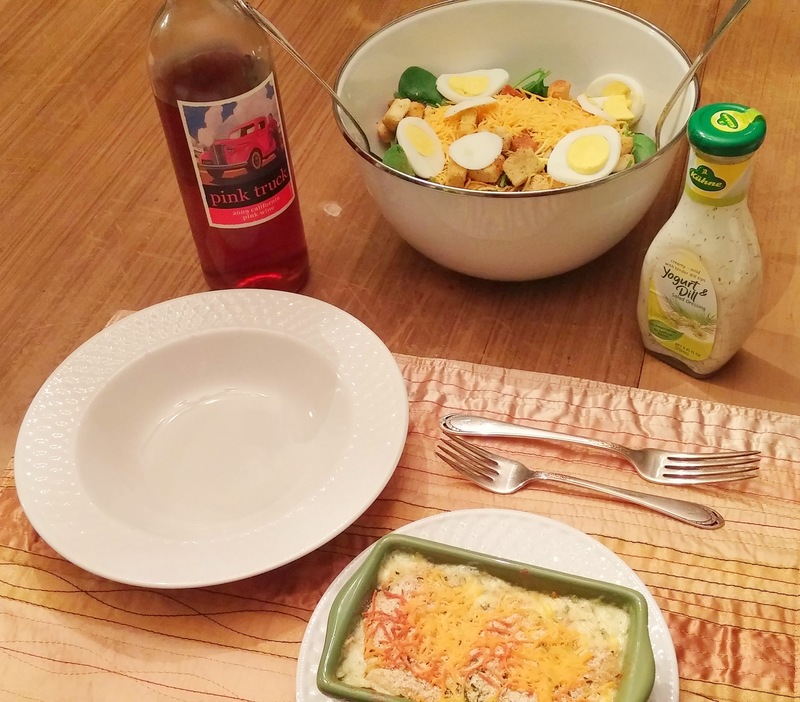 Tonight was Tuna Mornay with a spinach salad including croutons, chopped eggs, some shredded cheddar, and sliced almonds. The dressing we used was a yogurt dill. I didn’t realize until I assembled it all on the table that our meal was all the same colors. Very spring like, though, so I’ll take it! The best part is so far we’ve had leftovers from everything, including making an entire extra meatloaf to freeze as individual slices. The perk is that The Man and I had a very yummy lunch of meatloaf and tater tots today which was perfect with the impending snow.